There's nothing like a tail well told. Rita Mae Brown and her feline co-author Sneaky Pie Brown return with an all-new mystery featuring Mary Minor "Harry" Haristeen, crime-solving cats Mrs. Murphy and Pewter, and ever-faithful Tee Tucker the corgi. TAIL GAIT Spring has sprung in Crozet, Virginia - a time for old friends to gather and bid farewell to the doldrums of winter. Harry and her husband, Fair, are enjoying a cozy dinner with some of the town's leading citizens, including beloved University of Virginia history professor Greg "Ginger" McConnell and several members of UVA's celebrated 1959 football team. But beneath the cloak of conviviality lurks a sinister specter from the distant past that threatens to put all their lives in jeopardy. 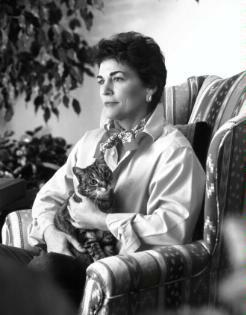 Rita Mae Brown is a prolific American writer, most known for her mysteries and other novels () . She is also an Emmy-nominated screenwriter. Brown was born illegitimate in Hanover, Pennsylvania. She was raised by her biological mother's female cousin and the cousin's husband in York, Pennsylvania and later in Ft. Lauderdale, Florida. Starting in the fall of 1962, Brown attended the University of Florida at Gainesville on a scholarship. In the spring of 1964, the administrators of the racially segregated university expelled her for participating in the civil rights movement. She subsequently enrolled at Broward Community College with the hope of transferring eventually to a more tolerant four-year institution. Between fall 1964 and 1969, she lived in New York City, sometimes homeless, while attending New York University where she received a degree in Classics and English. Later,[when?] she received another degree in cinematography from the New York School of Visual Arts. Brown received a Ph. D. in literature from Union Institute & University in 1976 and holds a doctorate in political science from the Institute for Policy Studies in Washington, D.C.Starting in 1973, Brown lived in the Hollywood Hills in Los Angeles. In 1977, she bought a farm in Charlottesville, Virginia where she still lives. In 1982, a screenplay Brown wrote while living in Los Angeles, Sleepless Nights, was retitled The Slumber Party Massacre and given a limited release theatrically. During Brown's spring 1964 semester at the University of Florida at Gainesville, she became active in the American Civil Rights Movement. Later in the 1960s, she participated in the anti-war movement, the feminist movement and the Gay Liberation movement. Brown took an administrative position with the fledgling National Organization for Women, but resigned in January 1970 over Betty Friedan's anti-gay remarks and NOW's attempts to distance itself from lesbian organizations. She claims she played a leading role in the "Lavender Menace" zap of the Second Congress to Unite Women on May 1, 1970, which protested Friedan's remarks and the exclusion of lesbians from the women's movement.In the early 1970s, she became a founding member of The Furies Collective, a lesbian feminist newspaper collective in Washington, DC, which held that heterosexuality was the root of all oppression.Brown told Time magazine in 2008, "I don't believe in straight or gay. I really don't. I think we're all degrees of bisexual. There may be a few people on the extreme if it's a bell curve who really truly are gay or really truly are straight. Because nobody had ever said these things and used their real name, I suddenly became [in the late 1970s] the only lesbian in America."